Arlington, VA/Detroit, MI (March 20, 2017)—As new development takes hold in once-distressed urban areas, it is important to address the risks of resident relocation and displacement that disproportionately impact low-income residents. With a focus on multifamily development in Detroit, a report from Capital Impact Partners identifies a number of practices that developers, investors, city officials, Community Development Financial Institutions (CDFIs), and public interest groups can use to plan for and responsibly manage development processes that may lead to resident displacement and relocation. The report, entitled “Baseline Study to Address Displacement and Relocation Tied to Multifamily Redevelopment in Greater Downtown Detroit,” examines a handful of redevelopment projects that have taken place in the city in recent years in order to identify those that required residents to relocate. Based on those findings, the authors lay out a range of strategies—from adopting tenant notification standards to providing financial transition assistance for affected households—that can help mitigate the negative social and financial consequences relocation may have on residents. One key recommendation of the report has already been rolled out. Known as Stay Midtown, the program provides rental subsidies current residents who earn between 50-80% Area Median Income (AMI) during the next one to two years. The report examines two displacement scenarios: (1) residents required to relocate due to rehabilitation of occupied or partially occupied multifamily buildings; and (2) displacement due to rental rate increases of “naturally affordable” units—typically defined as units that are affordable to an average neighborhood resident even without subsidies—which become less available in neighborhoods where housing demand is high. Applying federal standards for notification, right to return, and tenant assistance where possible. The Stay Midtown program is one tangible example of how these recommendations can be implemented. Launched in partnership with Midtown Detroit, Inc., with support from the Ford Foundation and Kresge Foundation, the program is also designed to respond to recent rental cost increases in Midtown and to address a near-term housing supply gap as nearly 2,600 housing units are scheduled to come online in Midtown over the next five years. The ultimate goal is to preserve the neighborhood’s character, preserve long-time residents’ access to the neighborhood, and continue the work of increasing opportunity for all residents who wish to live in Detroit neighborhoods. The long-term impact of relocation on residents’ quality of life will also be monitored along with how it affects neighborhood and community dynamics. While market stabilization efforts in Detroit are still largely focused on rehabilitating vacant structures, as opposed to occupied ones, if the market continues to strengthen and vacancy decreases, developers will begin identifying more occupied buildings for redevelopment. Thus, it is imperative that CDFIs, community-based organizations, advocacy and housing-rights groups, and government entities develop and have in place effective plans and policies to address the redevelopment of occupied properties. “This research will help to further inform our inclusive growth strategy and direct our lending toward the support of projects that accommodate a diverse set of residents at all economic levels. It is critical to ensuring that urban areas can provide equitable access to opportunity and critical social services,” said Ellis Carr, president and CEO of Capital Impact Partners. One area that the report authors will continue to monitor is the long-term impact of relocation on residents’ quality of life, along with how it affects neighborhood and community dynamics. 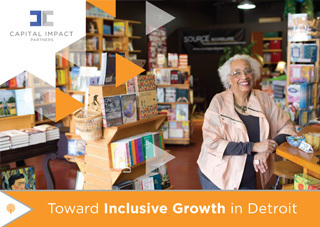 “As Capital Impact continues to finance projects in Detroit’s strengthening markets, we will thoughtfully evaluate our work to better understand these trends, and continue to partner with organizations that have expertise and programming experience in these areas to help us improve our efforts in building a Detroit for all Detroiters,” noted Scott Sporte, chief lending officer for Capital Impact Partners. About Capital Impact Partners: Through capital and commitment Capital Impact Partners helps people build communities of opportunity that break barriers to success. We deliver strategic financing, incubate new social programs, and provide capacity-building to help ensure that low-to-moderate income individuals have access to quality healthcare and education, healthy foods, affordable housing, and the ability to age with dignity. A nonprofit community development financial institution, Capital Impact Partners has disbursed more than $2 billion to revitalize communities over the past 30 years. Our leadership in delivering financial and social impact has resulted in Capital Impact earning S&P ‘AA’ and Aeris Four Star-AAA-Policy Plus ratings. Headquartered in Arlington, Va., Capital Impact Partners operates nationally, with local offices in Detroit, Mich., and Oakland, Calif. Learn more at www.capitalimpact.org.